Despite cats' reputation– cat Sisi likes fish and she is a favourite of Dolli girls. 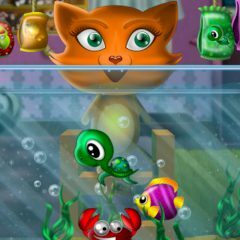 In this game you should help Sisi to take care of her fish. She has a big aquarium, where, besides many colored fish, you can find crabs, sea horses and, even a small octopus. Feed all this sea kingdom!